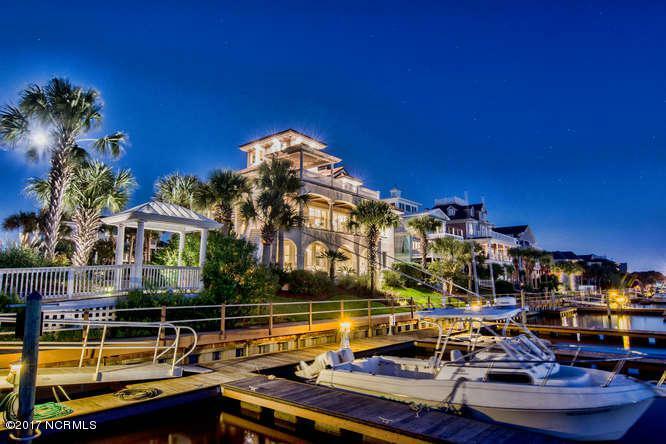 A waterfront luxury West Palm Beach style home situated on the northern-most point of Pleasure Island in the unmatched gated community of Oceana. This 4745 square foot home marked by it's signature stucco, arches, trey ceilings, and iron railings, is the definition of elegance. Tastefully appointed with travertine tile, custom built-ins and custom moldings throughout, all four floors are wrapped with picturesque views. With 104' of water frontage nearly 17' above sea level, 421 Marina St. stands lookout at the helm of Oceana's private marina. 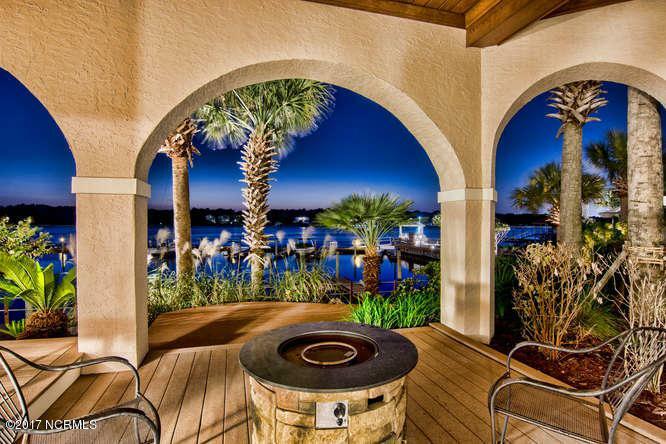 From nearly 1500 square feet of designer decks enjoy sunsets staring down the pipe of Snow's Cut and the intercoastal. 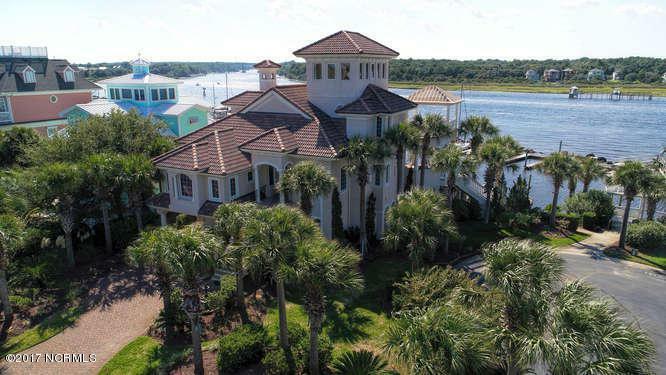 The scenery does not stop there, as marsh and ocean views go for as far as the eye can see.Truly one of a kind, the fastidiousattention to detail puts this home in class all it's own. The first-floor guest quarters hosts two bedrooms, two baths, laundry room,den/entertainment room and the wine cellar...Ride the elevator up to the 2nd floor where the main living quarter's open floor plan stuns with water views. Not lost among the class and size is the comfort and homey feel. 544 square feet of covered outdoor living space with grilling station on the second floor make this home perfect for entertaining. Huge third floor bedrooms and another 468 square feet of deck space foreshadow the treasure that awaits atop the spiral staircase that ascends to the fourth floor observatory which humbly boasts 365 degrees of the most breath taking amazing views in all of South Eastern North Carolina. The 33 large palms and meticulous attention to landscape detail pay homage to the home's Floridian style. 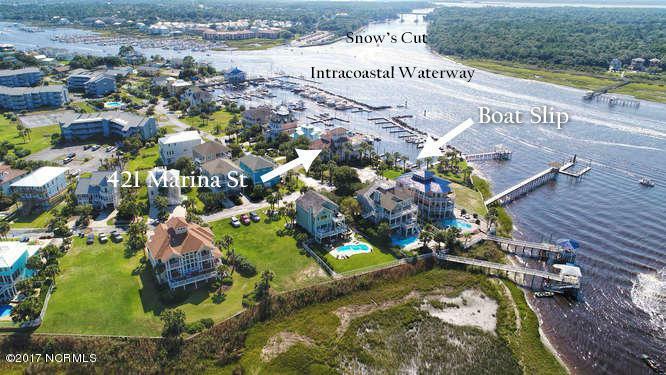 The 35' boat slip and private community marina for a back yard further accentuate the builder's intention and vision of a Fine Luxury Home Estate coupled with elite coastal living.